In January 2011, more than three years after the initial release of the coins, NGC announced that they had certified the so-called 2007 “Frosted Freedom” Proof Platinum Eagle which contained an obvious die polishing error. Later statements provided by the United States Mint indicated that the coins were actually pre-production strikes which had been inadvertently released into the production stream. Only an extremely small number were released and just three examples have been identified so far. The numismatic versions of the 2007 Platinum Eagle feature a design celebrating the executive branch of government with the depiction of an eagle with a shield at its breast. Draped over the shield is a ribbon containing the word “FREEDOM”. On typically encountered coins, the incuse word “FREEDOM” carries the same brilliant, mirrored finish found on the coin’s fields, making the word prominent within the design. On the error coin, the word appears frosted with the same finish found on the coin’s raised devices, making the word blend with the rest of the design. 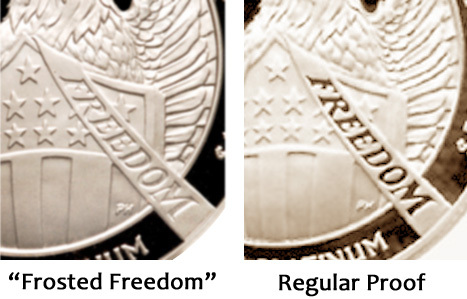 Although the 2007 “Frosted Freedom” Proof Platinum Eagles are referred to by experts as errors, the US Mint refers to these coins are pre-production strikes. They were created for review purposes and not intended for release. Before full production, the US Mint changed the frosting pattern to make the incuse inscription more readable. Some of the pre-production strikes with the initial frosting pattern were accidentally placed in the production stream for sale and distribution to collectors. The initial discovery specimen is a one ounce ($100 denomination) proof platinum eagle. A second example was discovered in February 2011 on a quarter ounce ($25 denomination) proof coin. The third example was identified in July 2011 on a half ounce ($50 denomination) proof coin. All three examples were certified by NGC. According to the United States Mint, the total population of “Frosted Freedom” coins that were struck and potentially distributed to collectors includes 12 one ounce coins, 21 half ounce coins, and 21 quarter ounce coins. In October 2011, the one ounce discovery specimen was acquired for $45,000 worth of coins in trade. The coin was acquired by the collector who discovered the second example of the error on a quarter ounce coin. In May 2014, a one-quarter ounce specimen graded PCGS PR70DCAM brought $69,300 at auction.